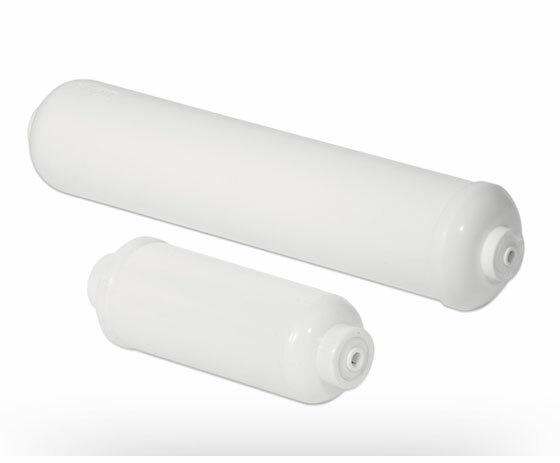 The IL Series of in-line water filters provide a simple, cost effective solution to water filtration. Using industry standard housings, the IL Series is available in either granular activated carbon, carbon block, or nanofiber filtration media. Additional options include KDF or phosphate for applications which require scale reduction. To simplify installation, the IL Series is available with either easy push-to-fit or threaded NPT connections. Clips are also available for easy mounting eliminating the need for expensive mounting brackets. Simple and effective solutions for sediment reduction. Using industry standard housings, these cartridges are an economical solution for sediment removal. Proven and cost-effective solutions for chlorine reduction. Utilizing the highest quality granular activated carbons, these cartridges are tested and certified against NSF/ANSI Standard 42 for the aesthetic reduction Chlorine Taste and Odor. Additional options include KDF or phosphate for applications which require scale reduction. Efficient and innovative solutions for improved chlorine reduction. Employing carbon block technology, these cartridges are tested and certified against NSF/ANSI Standard 42 for the aesthetic reduction of Particulate Class III and Chlorine Taste and Odor. Superior performance for additional reduction capabilities and claims. Utilizing proprietary carbon blends, these cartridges are tested and certified against NSF/ANSI Standard 53 for Atrazine, Cysts, Lead, and Lindane reduction and against NSF/ANSI Standard 42 for the aesthetic reduction of Particulate Class I and Chlorine Taste and Odor. Our most advanced technology for the highest filtration characteristics within the industry. Utilizing nanofiber technology, ParaGuard™ oﬀers exceptionally high flow rates, eﬃciency, and dirt holding capacity. In addition, this media has been shown to reduce virus, bacteria, cysts, volatile organic compounds (VOC’s), disinfection byproducts (DPB’s), endotoxin, natural organic matter, and other sub‐micron particles.